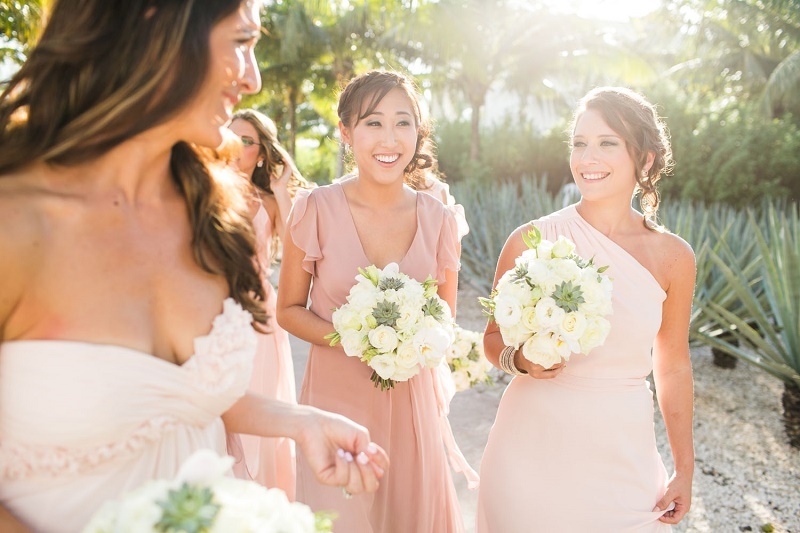 As featured on Style Me Pretty, we are delighted to share this beauty of a celebration with you! 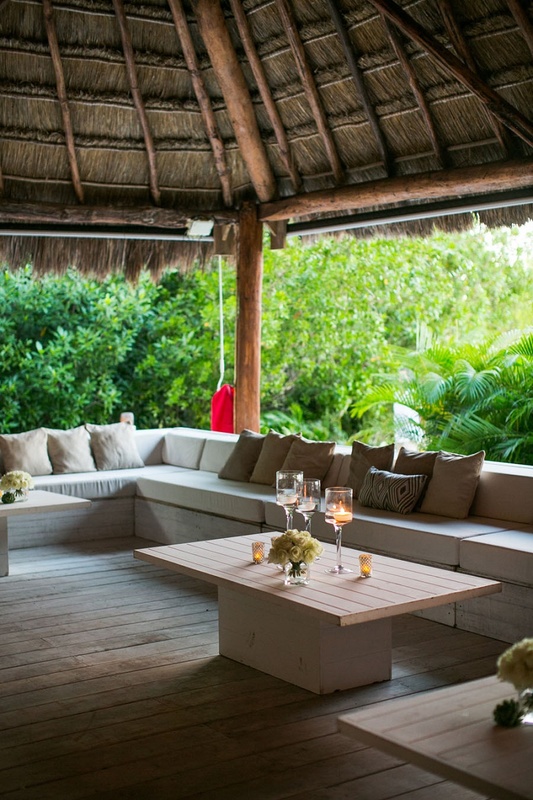 Situated along the 75-mile unspoiled Caribbean coast of the Riviera Maya, near the second largest coral reef in the world, is the Rosewood Mayakoba hotel. 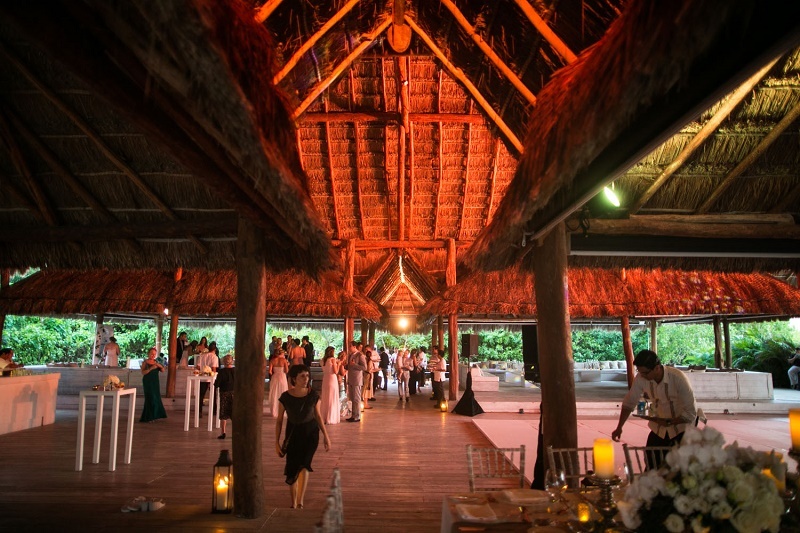 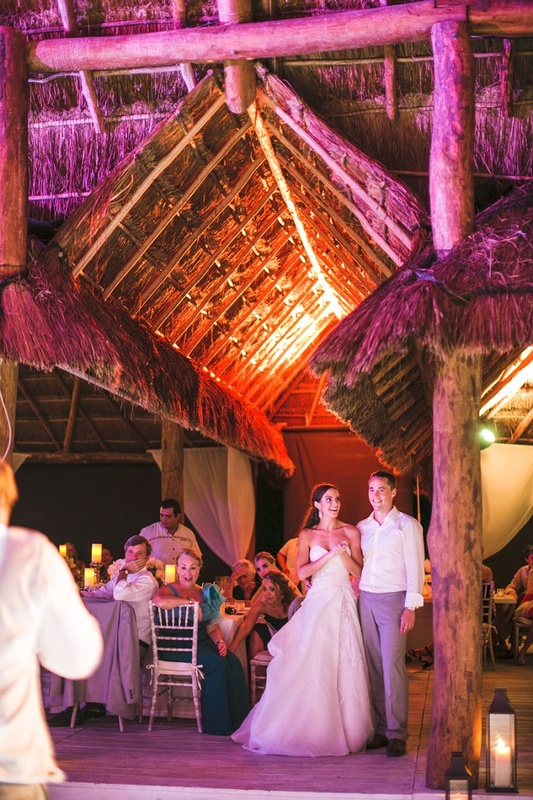 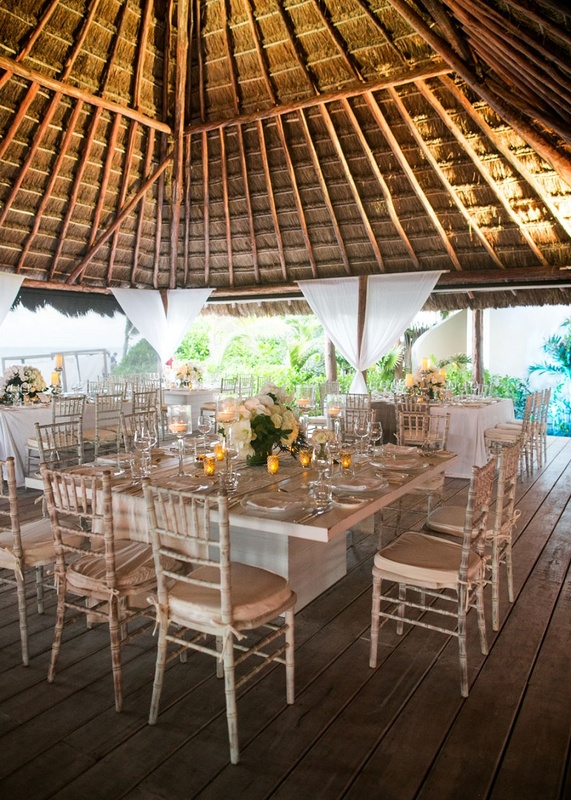 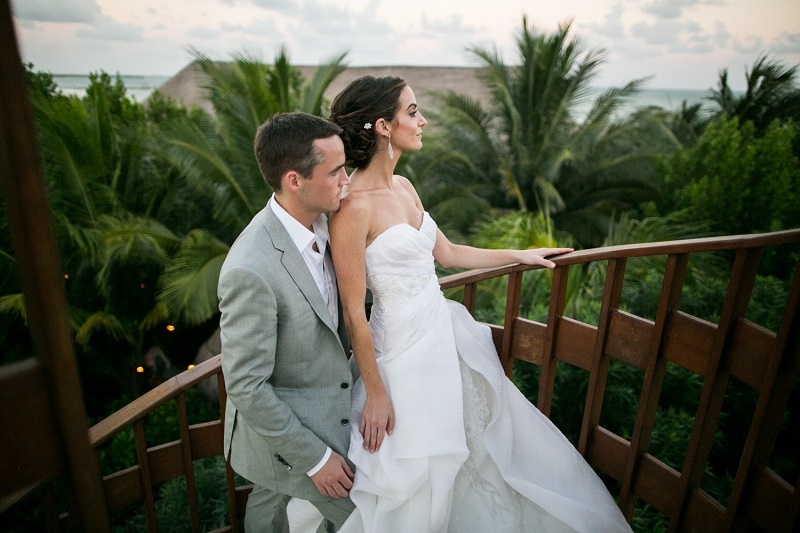 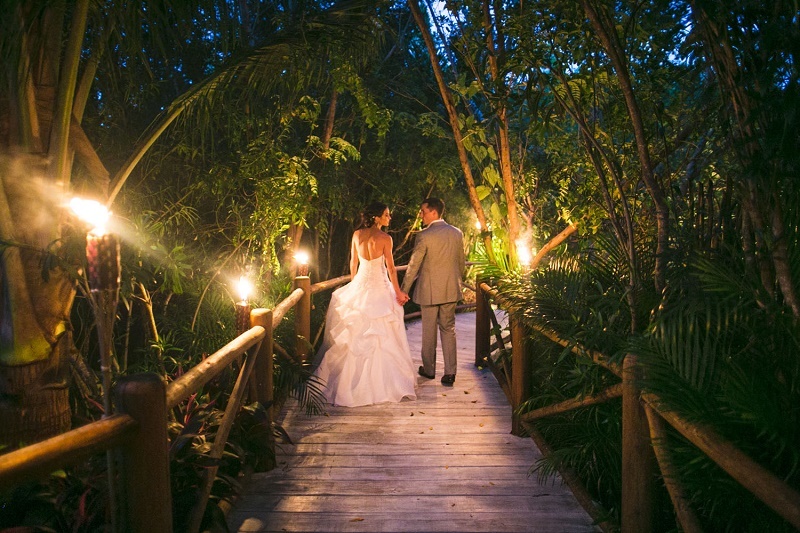 Our clients Meredith and Rob chose this inspiring location for their wedding celebration because it is imbued with natural beauty and harmony: white sandy beaches, azure waters, lush tropical jungles, Mayan heritage and the spirit of Mexico. 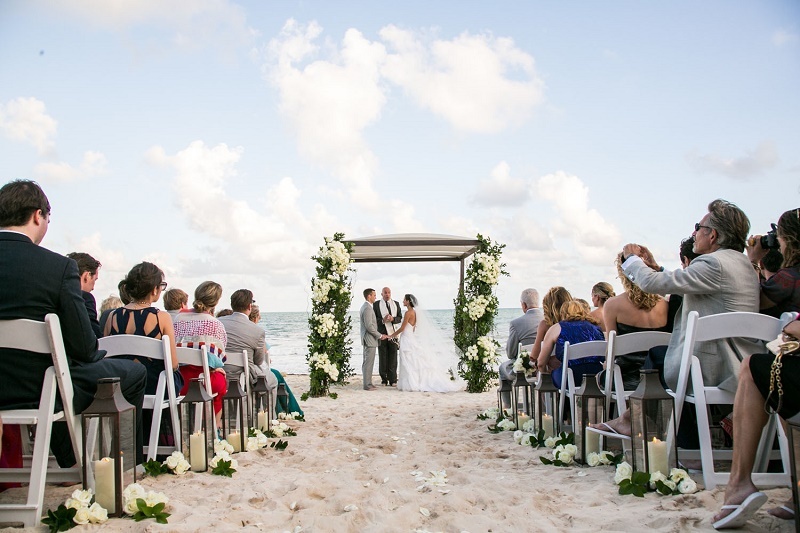 Located just 30 minutes south of Cancun and north of the seaside village of Playa del Carmen, their wedding guests were only a short distance away from historical Mayan ruins, ecological parks, breathtaking beaches, countless water sports, and world-class diving in the Great Mayan Reef. 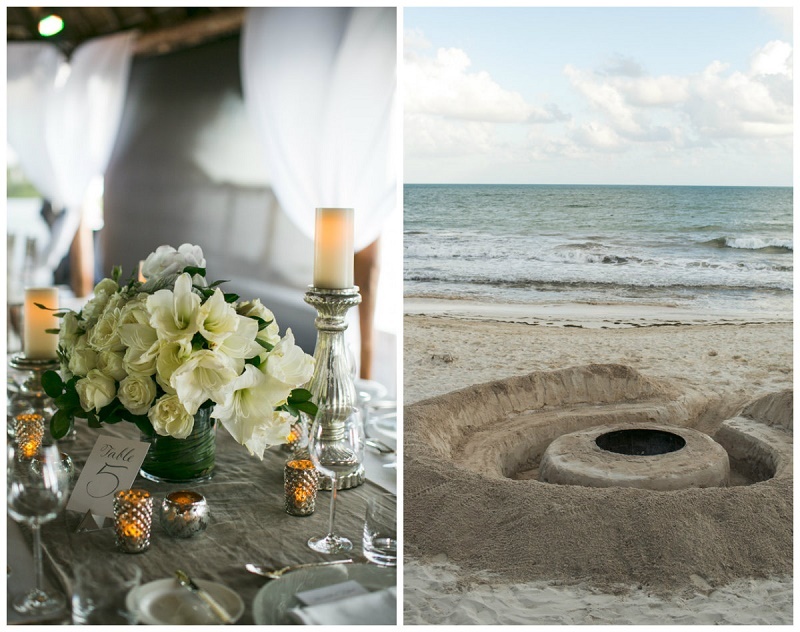 An unbelievable, one-of-a-kind wedding venue! 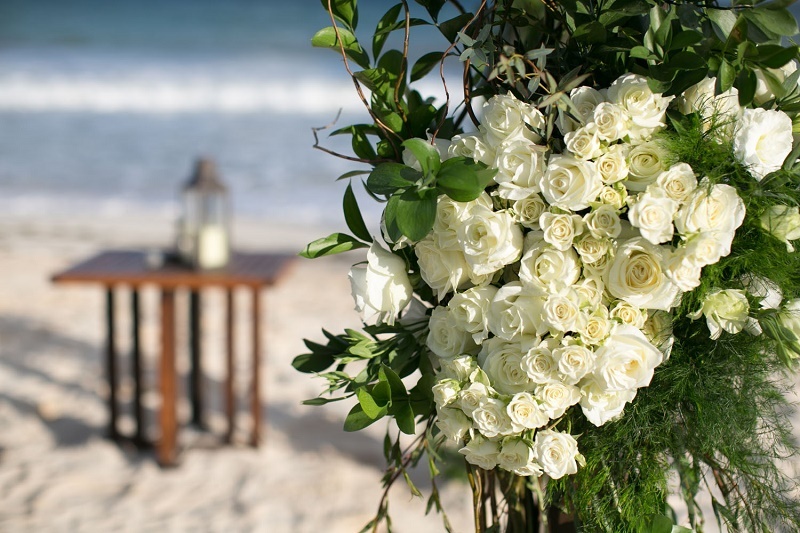 We designed the bridal bouquet and bridesmaids’ bouquets with white roses, spray roses, lisianthus, dendrobium and phalaeonpsis orchids, succulents, and tropical green foliage. 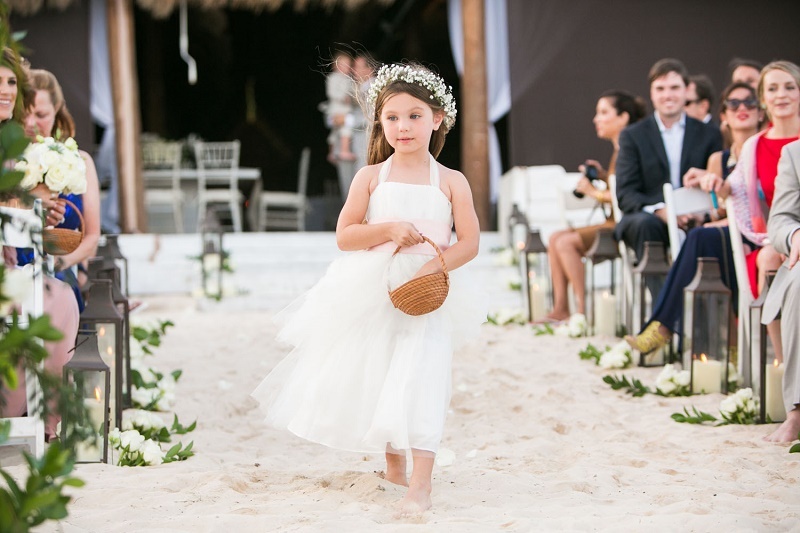 The little flower girls wore delicate crown wreaths composed of baby’s breath. 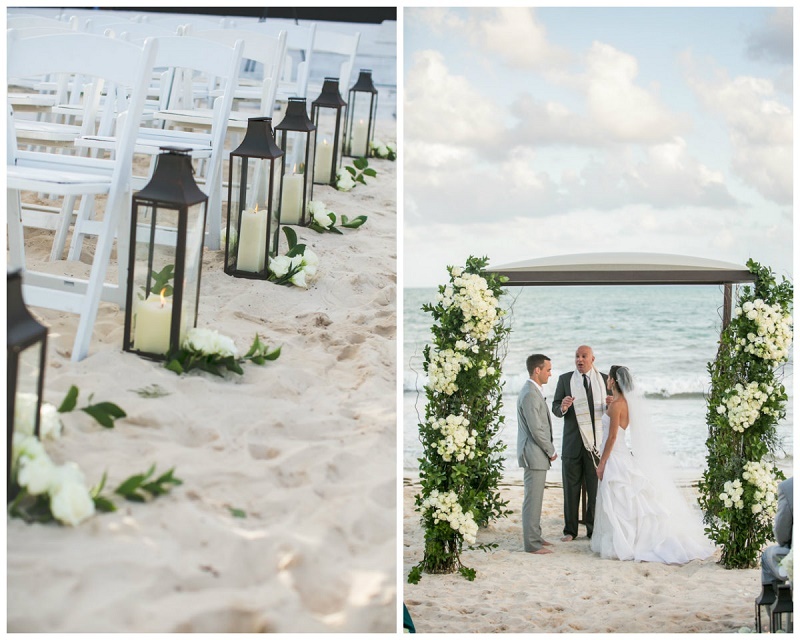 For the seaside wedding ceremony we built a custom-designed dark wood Chuppah with a ceiling of linen panels and a matching wooden table. 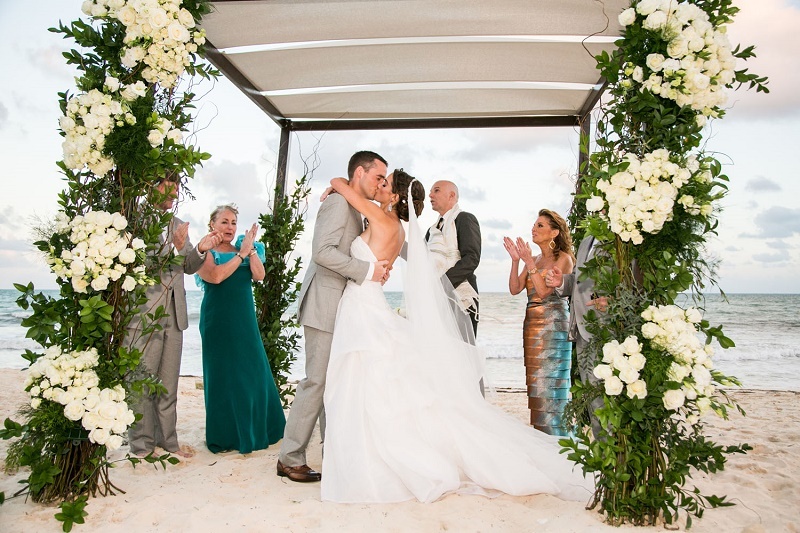 The ceremony poles were covered in lush floral displays created using curly willow, white roses and lisianthus, and lots of tropical green foliage. 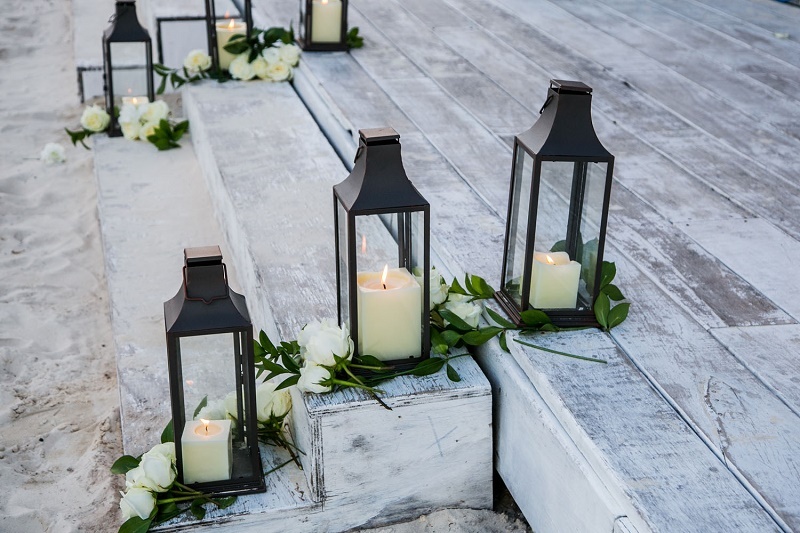 The matching metal lanterns placed down the aisle and on the ceremony table were provided by the wedding planners from Signature Event Design & Consulting. 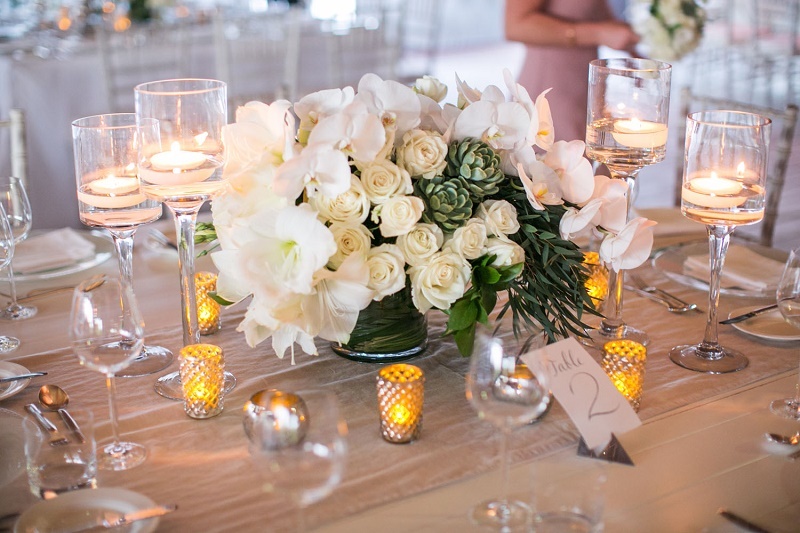 For the wedding reception we designed low, full floral arrangements in tones of white and ivory flowers such as amaryllis, roses, lisianthus, and orchids with pops of minty green succulents and shiny dark green foliage. 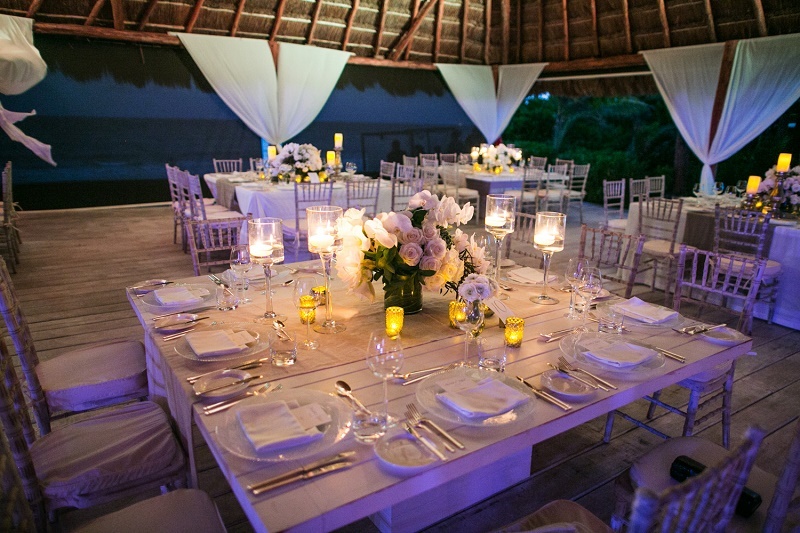 Glass hurricanes and vintage gold glass votives added romantic candlelight at different levels on the dinner tables. 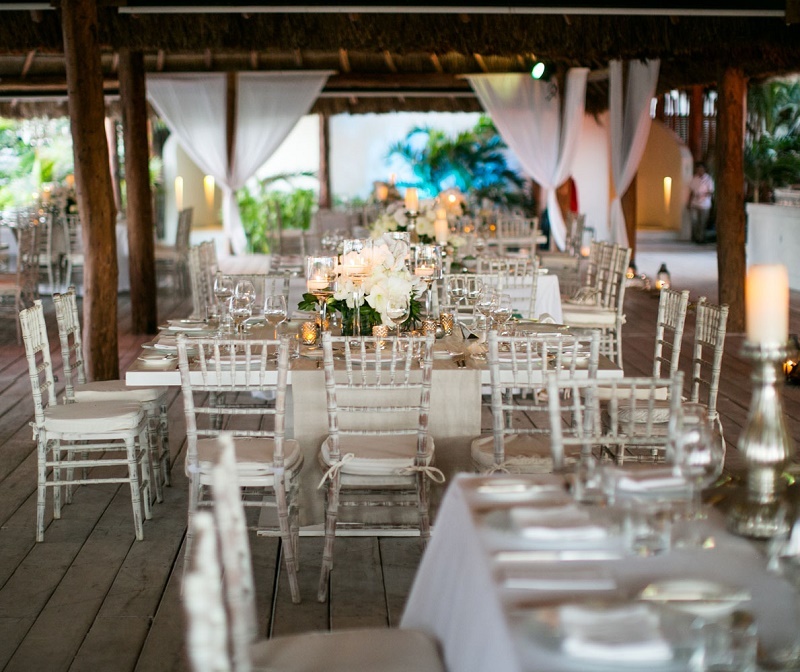 Soft billowing white drapes and weathered white-washed Chivari chairs completed the elegant beach setting. 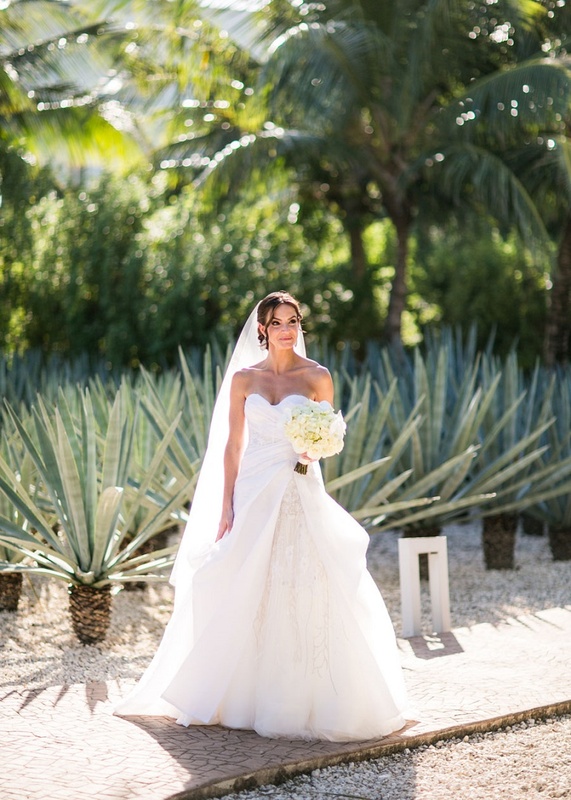 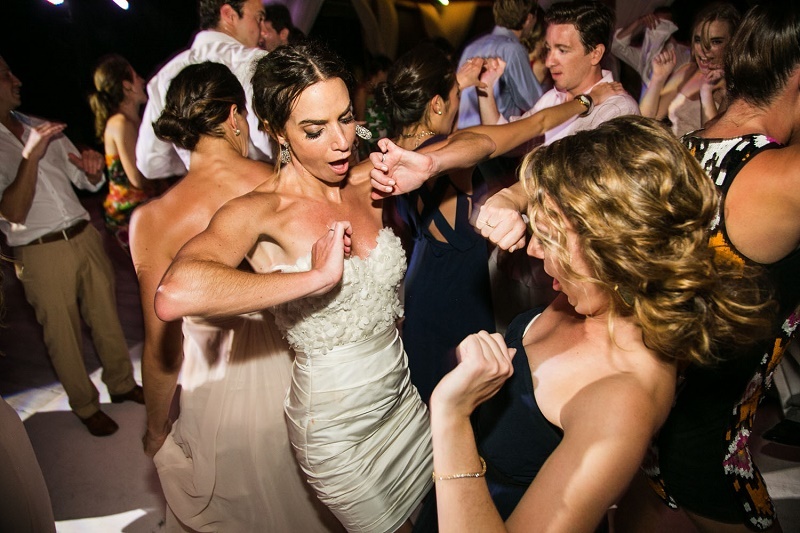 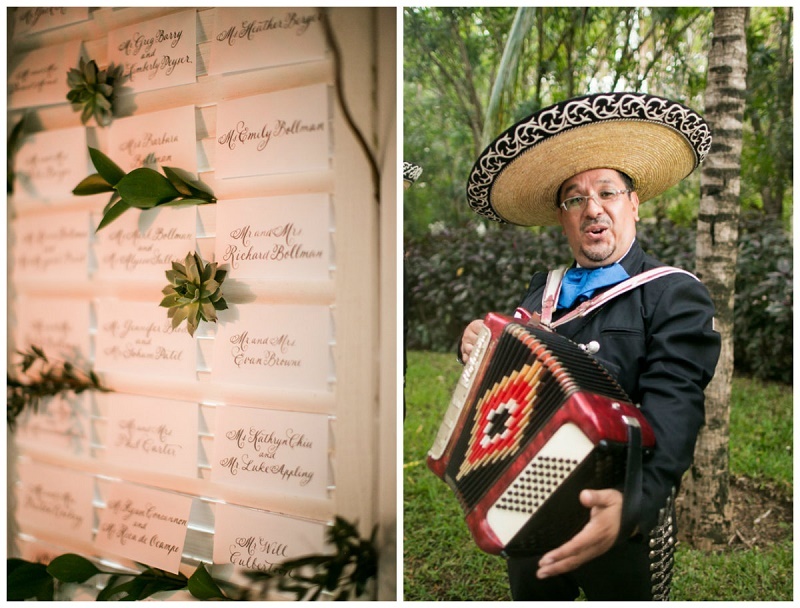 What we MUST state is just how absolutely fabulous the Rosewood Mayakoba staff to work with over the entire wedding planning period, as well as during Meredith and Rob’s wedding weekend. 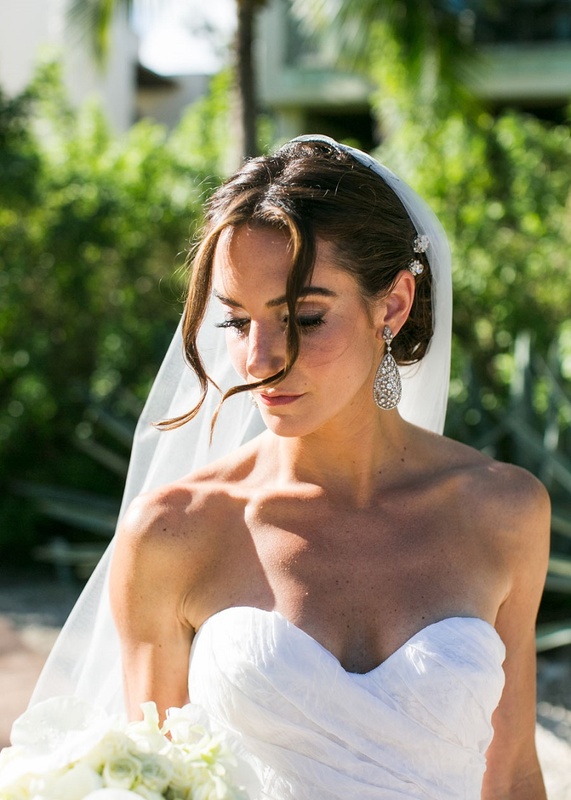 Gracious, elegant, friendly, flexible, and supremely professional. 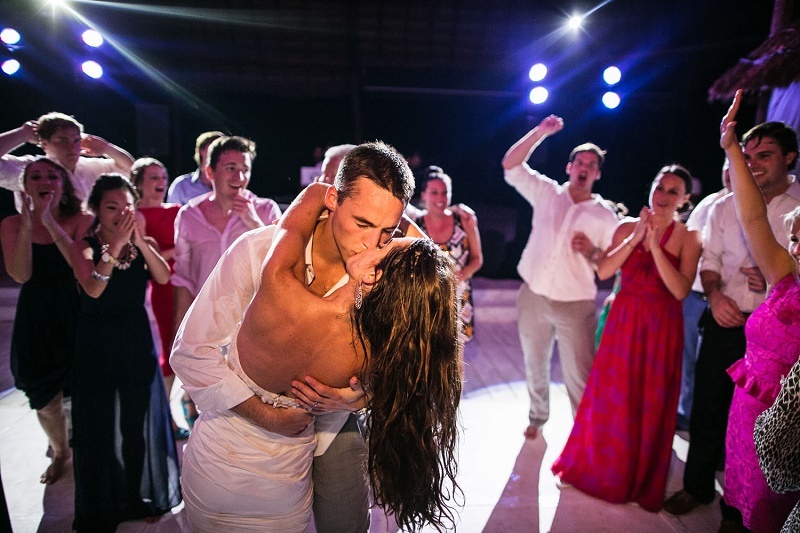 The entire staff was truly UNBELIEVABLE and the experience we had as guests at the resort over the nights we installed the wedding was AMAZING! 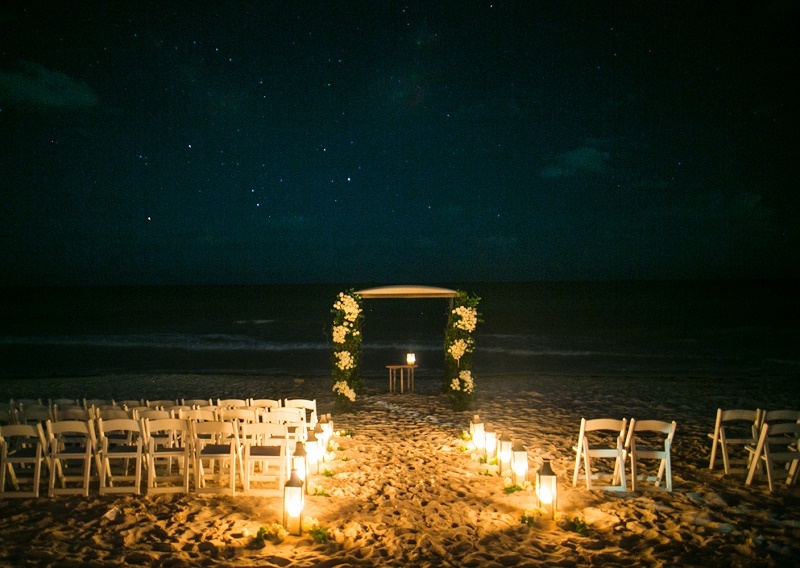 We truly felt at home… away home! 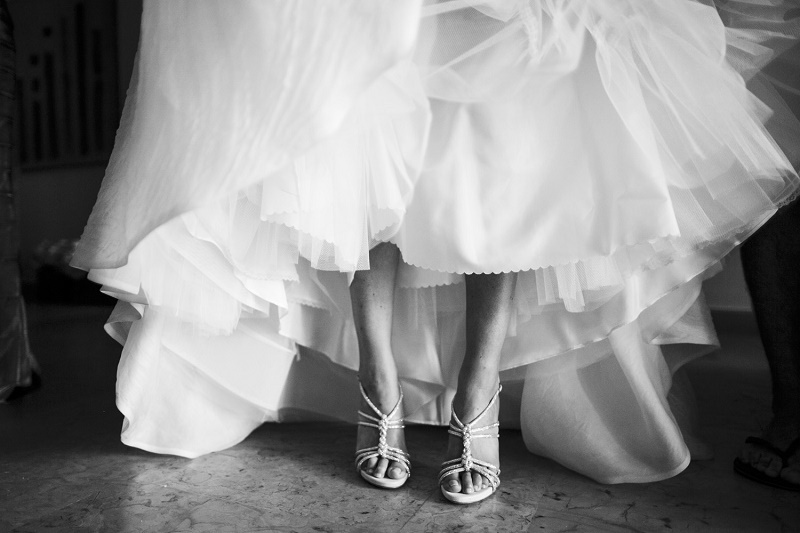 “I am my beloved’s, and my beloved is mine…” from Song of Solomon is one of the most moving, sentimental quotes for Jewish wedding ceremonies. 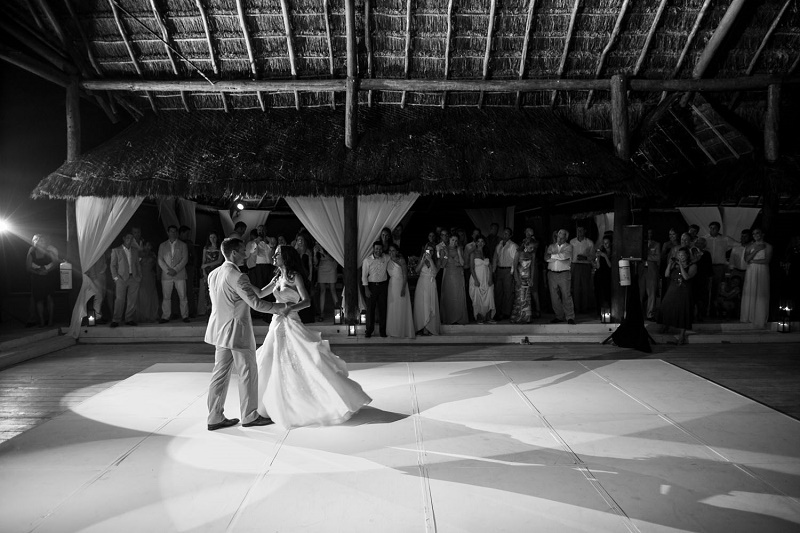 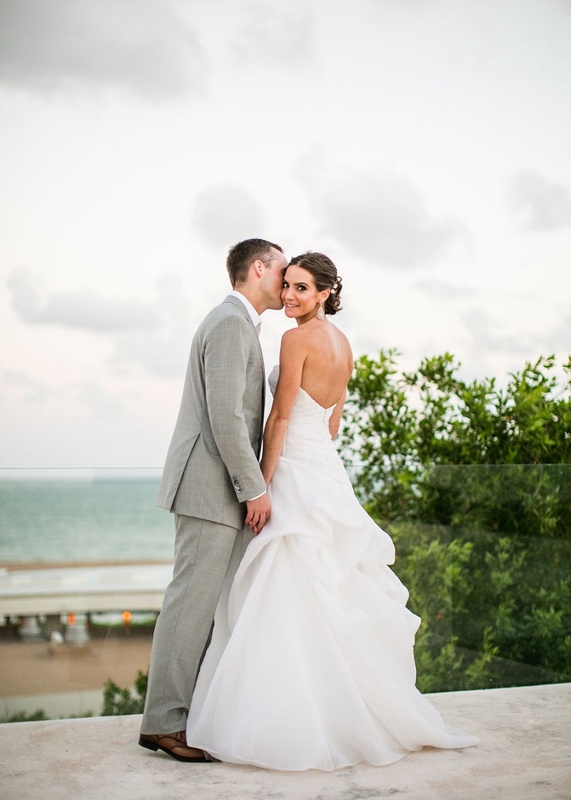 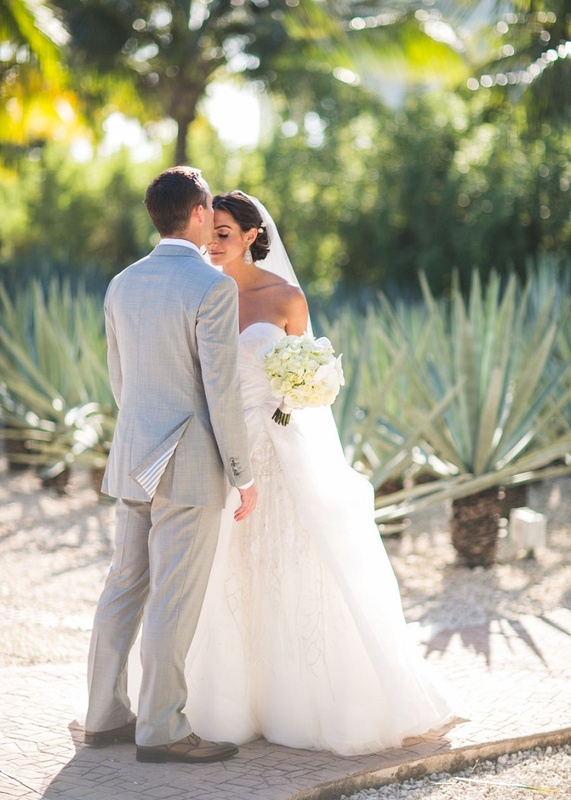 Of course, we love that our clients’ Meredith and Rob said those very words to each other in their beautiful Rosewood Mayakoba wedding ceremony this past December. 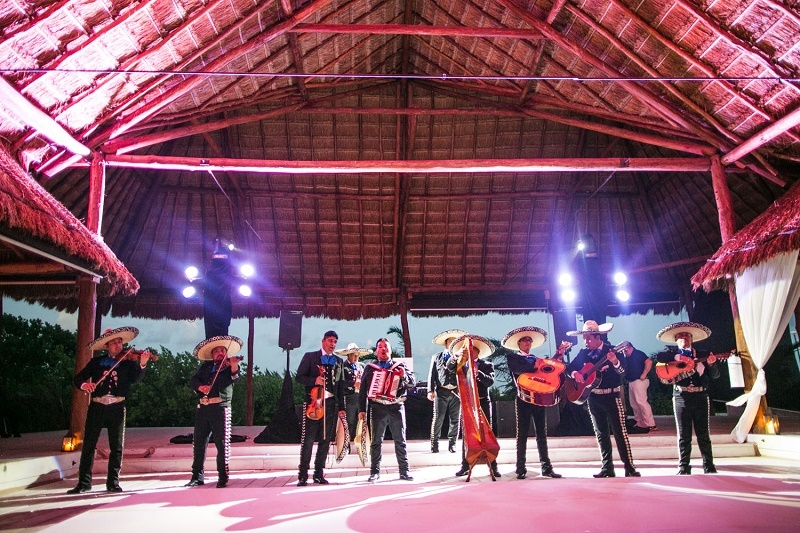 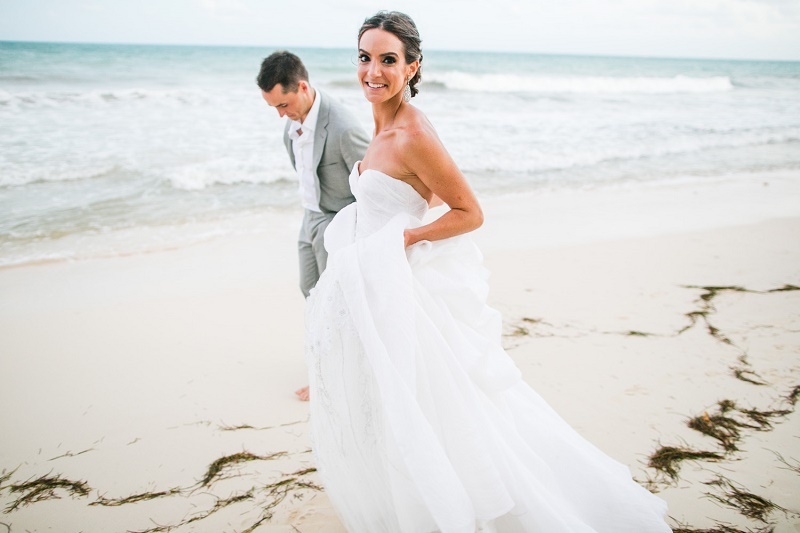 Captured on film in yet another gorgeous wedding video from our dear friends at Elysium Productions, you can experience highlights from the bride and groom’s entire Riviera Maya wedding celebration. 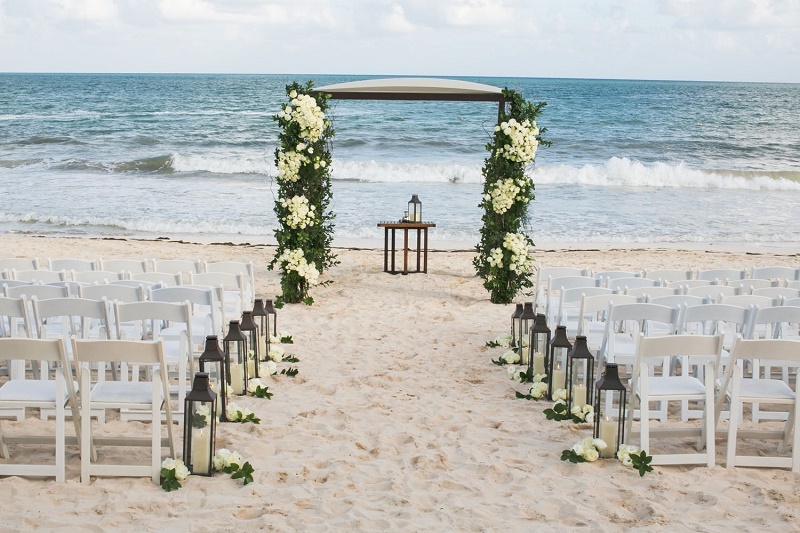 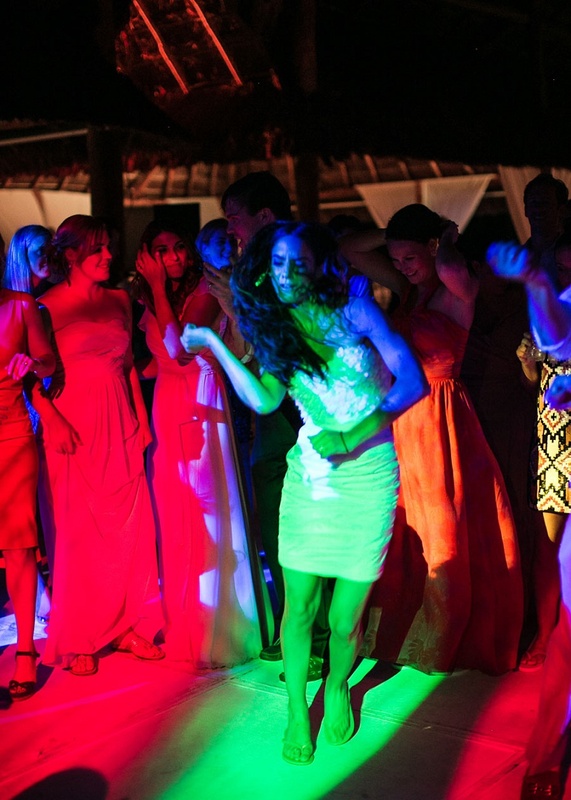 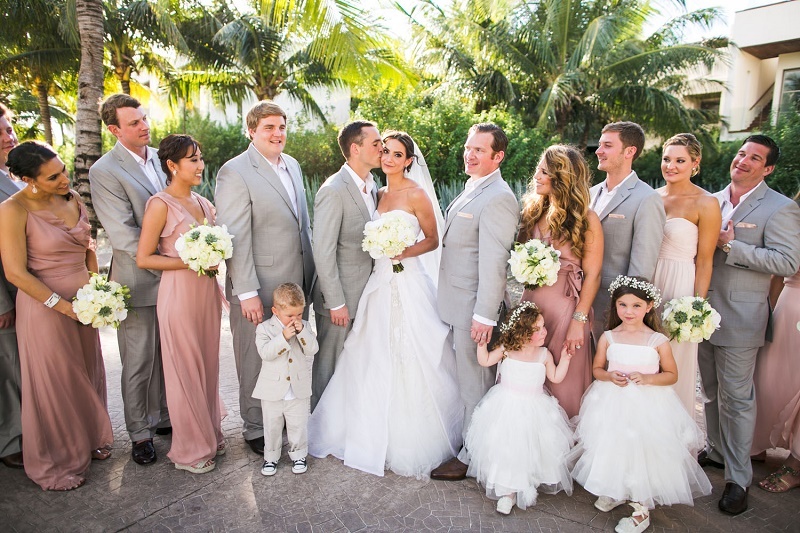 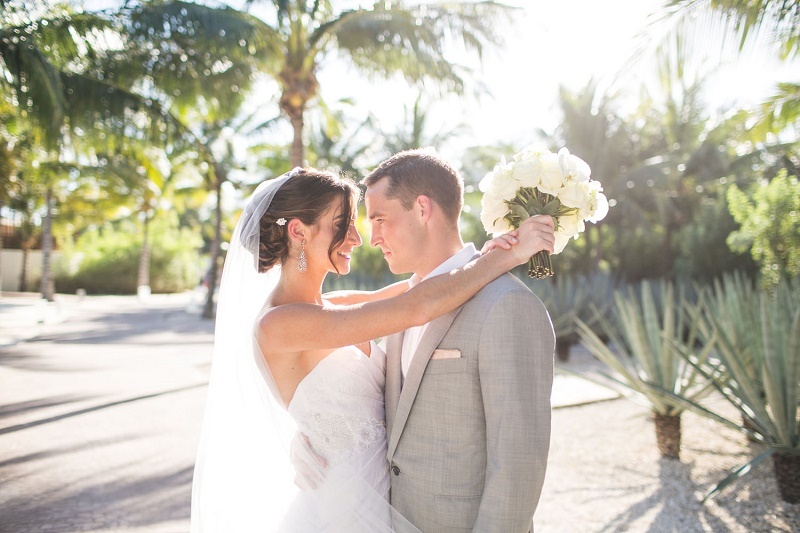 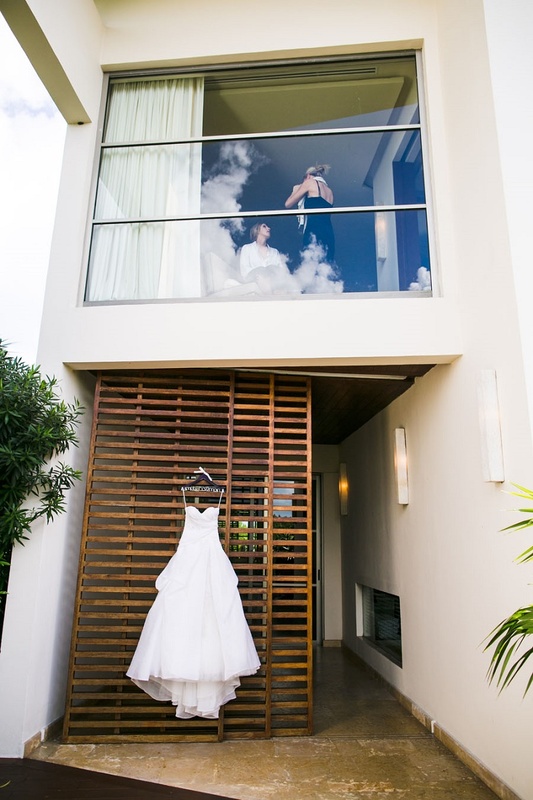 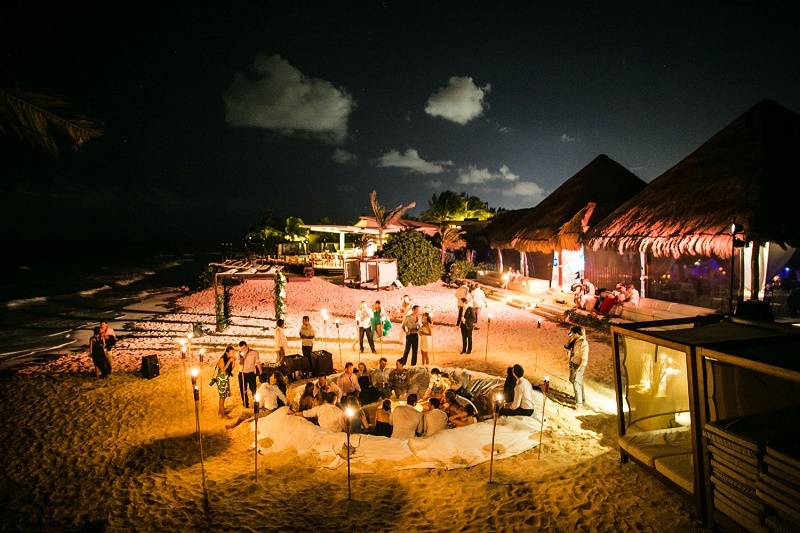 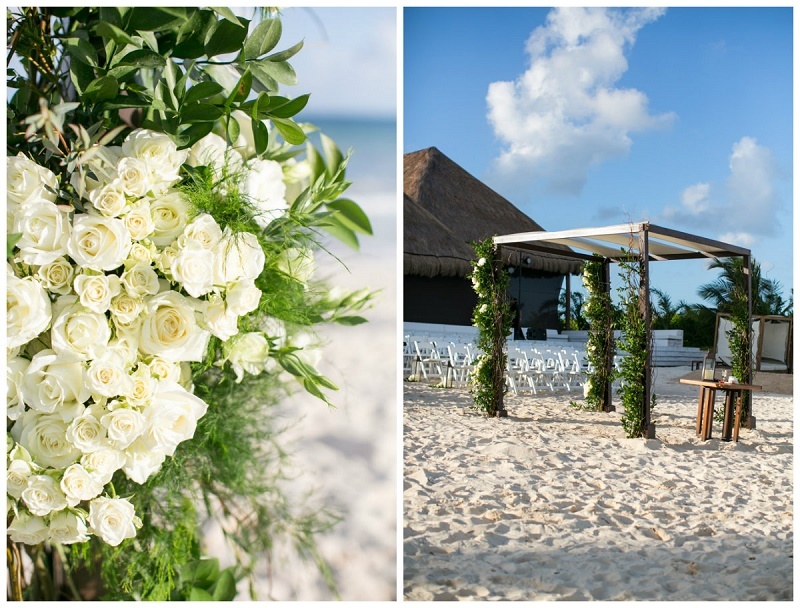 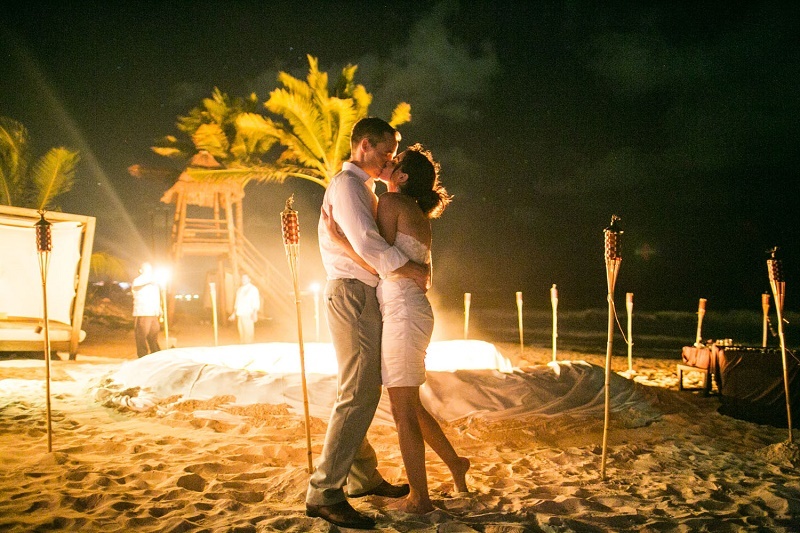 An Unforgettable Beach Wedding on the Riviera Maya as featured on Style Me Pretty!